There seems to be no standard way of dealing with UIPickerViews. Sometimes they are attached right to the bottom of the interface and never move around (like in the built-in Clock application.) Other times they fly up from the bottom like the keyboard but are embedded in a UIToolbar or UIActionSheet. The UIPickerView hides and shows very similar to how the keyboard hides and shows. 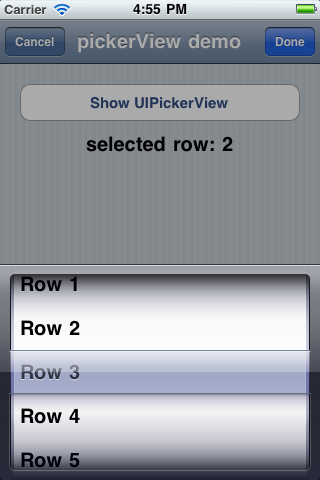 When the UIPickerView shows, the rest of the view (including the navigation bar) is dimmed. Tap anywhere in the dimmed area to hide the UIPickerView. The dismissal tap just dismisses the UIPickerView and won’t be picked up by the view in the background. To do this we create a custom UIView whose only job is to dim the background and receive the dismissal tap. Once everything is wired up, we hide and show the picker with – (void)showPickerView and – (void)dismissPickerView. Easy! A “done” button, while unambiguous, would cover up precious screen real estate and is a smaller target to hit than a dimmed background. At least for me, tapping the dimmed background to dismiss feels very natural. The fact that the background is dimmed implies that my taps will not affect any of the controls and whatnot in the background.